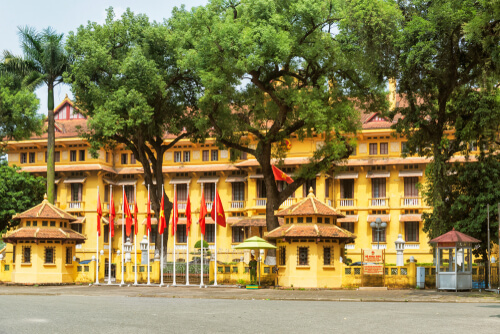 Situated on the banks of the Red River, the ancient city of Hanoi has been the most important political centre of Vietnam for the best part of a thousand years. Although Ho Chi Minh City in the south is larger, and Hue in the centre was the Imperial capital, Hanoi is where the decision makers have rules the region for centuries. In 1883, the French made Hanoi the capital of the colony of Indochina (today’s Vietnam, Laos and Cambodia) and the French influence can still be seen to this day. Luxury villas proudly stand on tree-lined boulevards (such as the beautiful Phan Dinh Phung street) and many churches and other public buildings have a distinctly French feel. 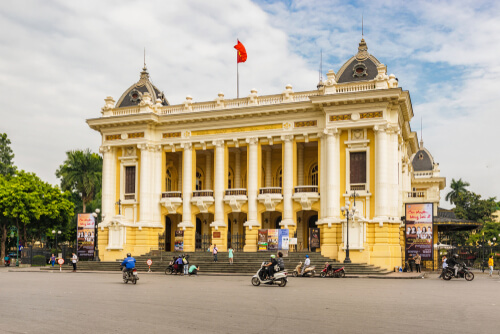 The Hanoi Opera House is even a facsimile of its sister opera house, the Palais Garnier in Paris. Many of today’s government buildings occupy former colonial buildings, the highlight of which is the Presidential Palace but the Ministry of Foreign Affairs and the Supreme Court Building are also wonderful examples of French colonial architecture at its best. It’s not surprising to the see the local’s queue up for banh mi – a French- style baguette stuffed with meat and pickled vegetables for breakfast. They sip coffee from street side hole-in-the-wall cafes, albeit a sweeter version than Parisians would be seen drinking. And they enjoy a fine banh flan – not dissimilar to the French crème caramel. When the French arrived many of Hanoi’s old buildings, temples and palaces were destroyed. However, today in the Old Quarter near Hoan Kiem Lake parts of the ancient citadel remain. Originally, each street in the citadel was named after a specific tradecraft where merchants would ply their trades. Today, streets where tradesmen sell silk, bamboo furniture or tin wears can still be found on ‘their’ streets. Some pre-colonial buildings still stand in the old quarter. 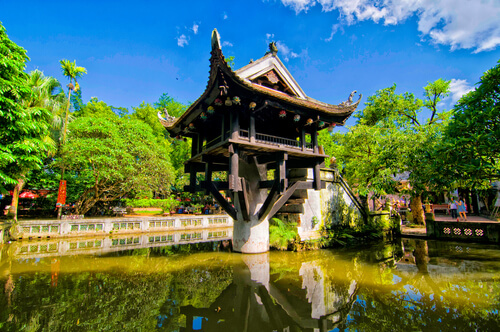 One Pillar Pagoda and the ancient Temple of Literature – the country’s first university and thought to date back to 1010 are two of the most impressive. For a look at the country’s more recent history, the capital’s museums are also eye opening. Having seen so many Hollywood portrayals of the American War (as it’s known), it is easy to forget that more than 3 million Vietnamese people lost their lives (compared to 58,220 Americans). The National Museum of Revolution and the Vietnam Military History Museum both offer an alternative viewpoint on that period of history. No trip to the capital would be complete without a visit to see the former communist leader and unifier of Vietnam Ho Chi Minh himself. Uncle Ho’s body lies in state in a mega mausoleum in Ba Dinh Square, putting him alongside other preserved communist heavy weights Lenin, Mao and Kim Il Sung. Hanoi is an incredibly beautiful city in no small part thanks to its many lakes. Sword Lake was named after a mythical sword that gave the Vietnamese King Le Loi the power to defeat the Chinese Ming Army in the 15th century. The sword was taken into the lake by a golden turtle so the story goes. West Lake is the largest of the city’s lakes and is a great spot for taking a bike ride around the lotus filled lake to see the many surrounding temples or for more simply watching the sunset with a cocktail in one of the many fantastic bars that surround it.